This month at work we had a contest to see who could do the best work space decorations – by department or individual. My team and I had a brainstorming session over a pad thai lunch and thought of ways to liven up the office. We got excited and soon decided to go with a giant gingerbread house (check out my Instagram for photos!). It had been a long time since I’d brought out my glue gun and pipe cleaners. I had so much fun crafting and getting into the Christmas spirit I knew I had to make something for the apartment. 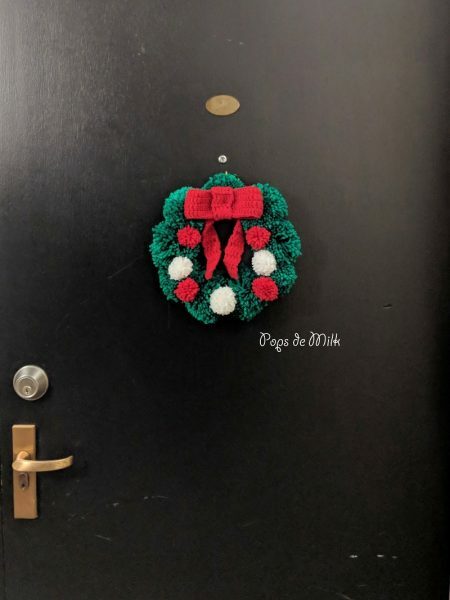 So with Christmas just around the corner I thought, how about a quick and easy to make holiday wreath? For this project I used the Clover pom pom makers in the largest and the smallest sizes. Of course you can always make your own pom pom maker – there are tons of tutorials on how to make them out of cardboard – but these pom makers were perfect for making several pom poms. For the yarn, I used Yarnspirations Super Value acrylic yarn in Kelly Green, White, and True Red. 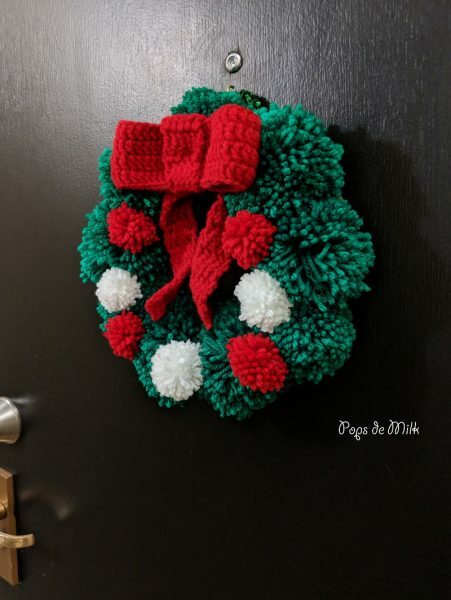 I made enough large green poms to make a circle and some small white and red ones. With a utility knife I cut out a slim donut shape out of a sturdy cardboard box. Now, this is where my inner craft nerd got super excited. I used my trusty glue gun to stick the pom poms onto the cardboard. I don’t know what it is about using a glue gun but it suddenly makes whatever you’re working on that much more extreme. Whoa! Watch out, she’s bringing out the glue gun! 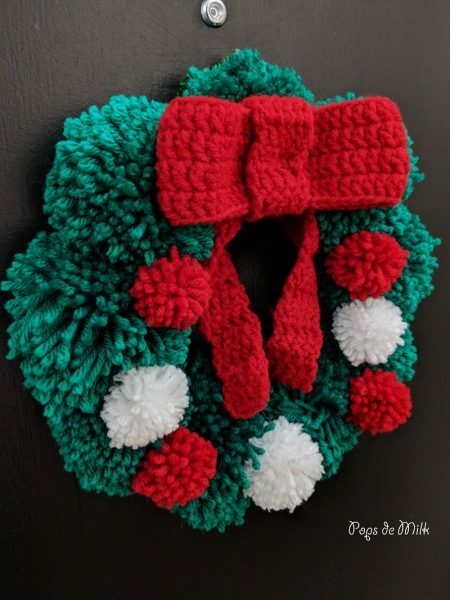 Once the pom poms were attached I added a crochet bow – tutorial on how to make a crochet bow to follow. But if you’re really short on time you can use ribbon or a ready-made bow. Now I have a fun and bright wreath and my front door is decorated. I just love when last minute decorations come together. Don’t you?